Weather here is erratic these days. It’s extremely hot at times and suddenly there is a heavy downpour. So I’m switching between soups and salads. Yesterday was one such cloudy, rainy day and I decided to make some soup for dinner. I had about 5 pounds of carrots at home (I blame Costco/the husband for this), which made me want to use it as much as possible. I already have a carrot soup recipe here, so I wanted to make another variation of it and decided to use the 1 big beet which was remaining after making this beet salad. 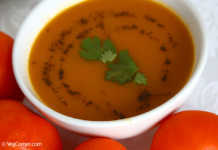 I love the combination of carrot and ginger, so I incorporated that too in this soup recipe. I actually felt that I could have used even more ginger because the sweetness of beets and carrots masked the ginger I had used and I really didn’t taste it at all. 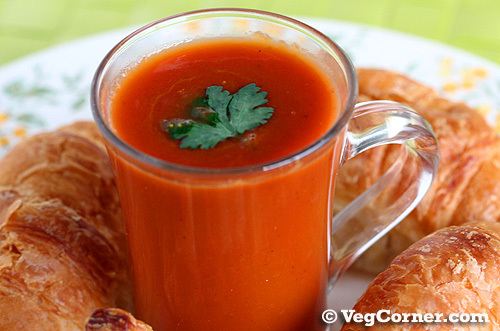 This soup gets an amazing orange hue, like a tomato soup because of the combination of the vegetables we are using. 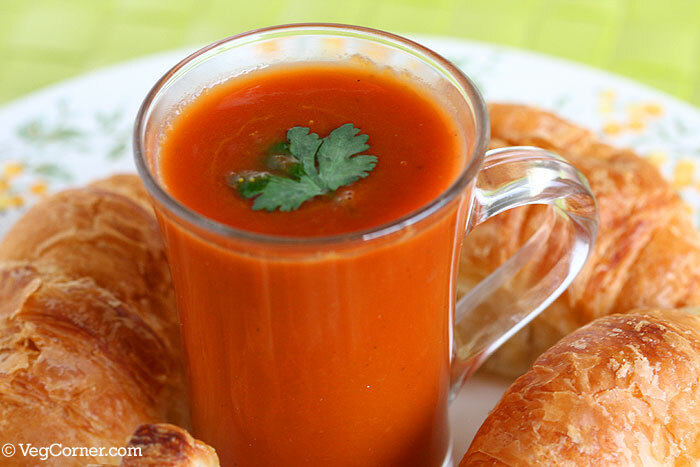 Not a single tomato is used in the recipe and yet it looks like a tomato soup. I wanted to make it a vegan soup, so I did not use butter to fry the onions. In a pressure cooker (check My Notes if you don’t have a pressure cooker), add the oil and heat it for about a minute. Fry the onions, ginger and garlic. Add a pinch or two of salt to quicken the cooking of onions. Once the onions become translucent, add the beets, carrots, turmeric powder (if using) and vegetable broth. Use broth just enough to cover the vegetables. Add some more salt and pepper. Close the lid and cook it for 2 whistles. This should take about 15 minutes. Once the pressure is released, open the lid of the cooker and puree the cooked vegetables using an immersion blender. If you choose to puree it in a regular blender you will have to wait for the vegetables to cool down completely. Add some more water if you need a thinner consistency soup. Taste and season with some more salt and pepper accordingly. I felt that the soup needed some lemon juice, so added that before serving and garnished it with some fresh coriander leaves. 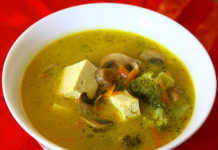 Pressure cooker is not a must to prepare this soup. You can use a soup pot or any other large vessel and follow the above instructions. It might just take another 10-15 minutes for the vegetables to cook completely. Depending upon the sweetness of the beets and carrots, you might have to increase the quantity of ginger and pepper. Discovering this site of great recipes is wonderful, thank you. 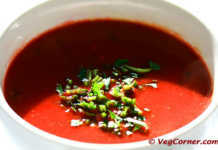 Is is possible to substitute the onions in Beet, carrot ginger soup with something else? I look forward to trying the recipes here. I was bored to make my usual beet root kootu. Tried your soup and enjoyed. Thanks for trying the recipe, Shobana. Hello Madhu, Do you have slow cooker? Have you tried soups with slow cooker? I don’t have a slow cooker Krithika, so don’t know anything about it. What a great way to get veggies in! I’ll have to give it a shot this weekend.